EGGS; BEYOND SCRAMBLING AND BOILING! 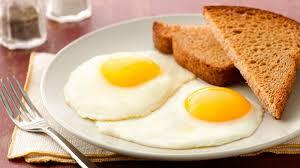 Eggs are said to be one of the most nutritious source of protein. They present protein to our body in a way that is very easy to accommodate. There are other interesting ways to eat eggs other than frying and boiling them, one of which is ‘sunny side up’. Sunny side up is one of the most easy, yet amazing way to prepare egg. Try out the recipe below, it’s fantastic! 1. Heat oil in frying pan until just enough to sizzle a drop of water. 3. Reduce heat and spoon over the eggs until it is coagulated(solidified) to the appropriate or desired consistency. Do not turn over the eggs.